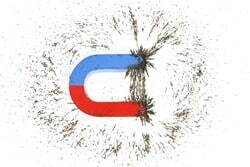 Magnetism is a term that refers to the physical phenomena which occur when the magnet field surrounding an object exerts a force upon the particles of another object. All materials are to an extent magnetic but some experience it more strongly. Magnets can be created by the influence of a natural magnet if a natural magnet comes into contact with an object that feels the effects of the magnet force strongly. However, there are also permanent magnets known as ferromagnetism and this is the type most commonly felt by people. The best type of magnet to use in magnet fishing is a neodymium magnet which is a rare earth magnet (found naturally) and are the strongest magnet you will find. They are also quite commonly referred to as NdFeB magnet or NIB. These generally are composed of Neodymium (Nd), Iron (Fe) and Boron (B). In fact, they are a fairly new invention and have only become widely available to the general public relatively recently. Neodymium magnets are denoted by the letter ‘N’ e.g. N38, N43 etc and this refers to the grade of the magnet material they are made from. It is said that the higher the number the better the magnet but this is a term used only very loosely. Sometimes a letter follows the numbers and this refers to the temperature rating for the magnet, you don’t always see this. 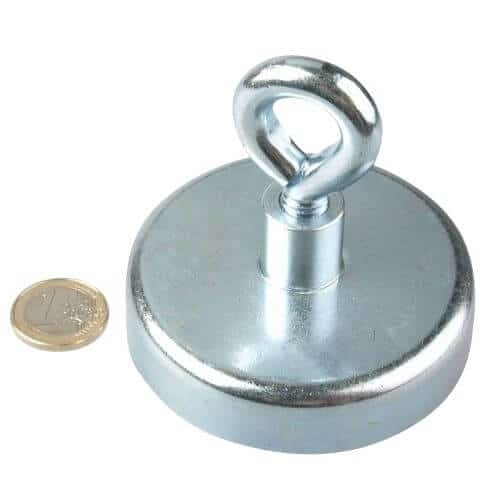 Neodymium material is naturally prone to chipping and scuffs as it is quite brittle for this reason it does not take too kindly to people trying to machine their own magnets to improve their magnet fishing experience no matter how tempting this can be. The problem is that machine can generate heat (and also remove chips) and magnet’s do not take too kindly to high temperatures. They work fine at normal temperatures but if you throw a magnet in a fire or furnace for example then it is likely to lose its magnetism. This is not true for physical damage such as drilling to attach another eye hook or something, you are more likely in this instance just to damage your magnet but please keep them away from high temperatures as this would not fair well for your ability to recover metallic objects from that canal or lake!